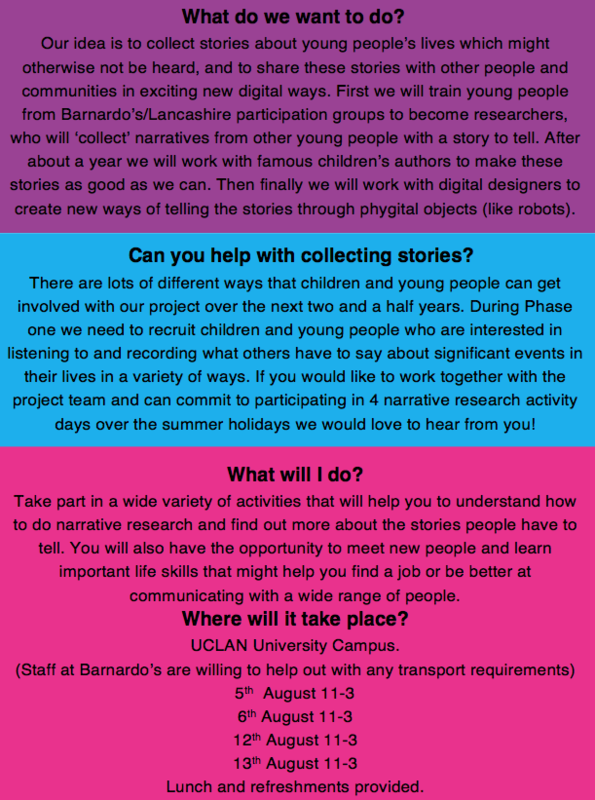 Stories to Connect was about collecting stories about young people’s lives which might otherwise not be heard, and sharing these stories with other people and communities in exciting new digital ways. We have built up a fantastic network of supporters such as Barnados. Most of the young people involved have joined UCAN. This is a group of young people who come together once per month to design and be involved in research projects about young people’s lives. Young people learning to be researchers and interviewing other young people. Meeting with people who can support young people with their projects such as authors, animation and film makers. Visits to find out about other people’s lives. Creating stories, phygitals or artworks. Telling other people what young people have found out. The Stories 2 Connect Team are committed to sharing decision making with children and young people and listening and acting upon advice provided by groups of young people.